Mensusa https://www.mensusa.com/articles/travel-blazer-is-the-most-important-accessory.html Travel Blazer Is The Most Important Accessory When You Are On The Move People who need to travel a lot, always keep their travel bags ready with the most important clothes and accessories to maintain style. A travel blazer is the most needed attire that he has which may be a cashmere blazer or any other unique variety of travel blazer. Travelling in an organized way is a mark of style and standard. A man who carries a travel blazer looks smart and elegant and always looks well dressed and trendy. A travel blazer is highly impressive and although it may look like an ordinary blazer, it has various features that makes it one of the must-have accessories in a man's wardrobe. The specialty of a travel blazer is that it has a built-in inflatable neck pillow that gives the wearer comfort when he hops from one place to another. Every sophisticated individual has a craving for cashmere jackets and travel blazers as well as cardigans. A cashmere blazer is made of sheep's wool but the fine undercoat fiber of cashmere goat and other species that are reared in Kashmir and North West India are simply outstanding. The fleece of these special goats have a double layer with a coarse layer on the outside that is water-proof and the inner layer has ultra-fine hairs that makes it soft and insulating. The lower coat is used to make cashmere wool. Hence the unique warm material used to create the designer cashmere blazer makes it so expensive and a must-have accessory especially for sophisticated men around the world. The cashmere blazer available at MensUSA are of the highest quality and the different sizes spread out at the store make it easy for all shoppers to get their blazers without a hassle. A camel hair blazer is not an easy buy. You will get genuine blazers only at selected stores like MensUSA. Camel hair like cashmere goats fleece has two layers. The inner layer that is extremely soft and warm is used to make camel hair blazer. This variety of fabric made from pure camel hair is collected mostly from bactrian camel that are found mostly in Mongolia, Tibet, Russia, China, Turkey, Iran and others. A tedious process is followed before the final product is obtained. Hence camel hair blazer is costly and owning it is a luxury for ordinary men. If you are interested to own a camel hair blazer, visit MensUSA for the finest quality and latest designs to flaunt your style and sophistication as it has a distinct attraction. Most men have a wrong notion about their attire. It is not always necessary to wear a full suit or a tuxedo suit to look great. A tuxedo blazer can work wonders for you if you select the perfect size and color for the occasion. 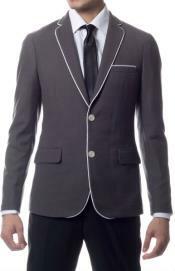 At MensUSA there are different types of tuxedo blazers of different sizes, styles and cuts. According to your stature and height, select a fitted single-breasted or double-breasted tuxedo blazer to enhance your looks. You can match your tuxedo blazer with appropriate accessories according to the occasion. If you choose a neutral color tuxedo blazer like the midnight blue, black or white with unique lapels, you will look different at every event for you have the option of matching your tuxedo blazer with other accessories.